Medical Detection Dogs given permission to launch world’s first breast cancer detection trial. The charity, which recently won the support of the Duchess of Cornwall, has spent the past 18 months preparing an application to the Buckingham NHS Trust ethics committee for permission to begin the trial, which will use breath samples from volunteers in Buckinghamshire and the olfactory powers of its dogs. The application has now been approved and the trial will be underway soon. Since its foundation seven years ago, Medical Detection Dogs has trained dogs to detect prostate, renal and bladder cancer in urine samples. It is seen as a world-leader in its field and now advises smaller clinics in Europe, Australia and the USA. Although it’s not been determined exactly what it is the dogs detect, it’s thought that volatile substances emitted by cancerous cells are present in the urine of cancer patients and that these give off an odour perceptible to dogs. Dr Claire Guest, founder and chief executive of MedicalDetection Dogs, was alerted to her own breast cancer by her dog. She will be principle investigator of the trial and said she hopes to find volatile substances in breath samples collected from breast cancer patients. "Under current procedures for detecting breast cancer, many women have to wait until they are 50 before they are invited in for their first mammogram. As someone who has had breast cancer significantly younger than that I’m painfully aware that that would have been too long for me to wait before being scanned for the first time. 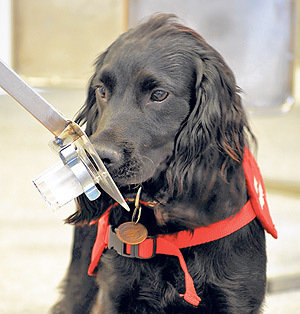 Previous trials carried out by Medical Detection Dogs include a 2004 investigation into the detection of bladder cancer using urine samples, published in the British Medical Journal, and a 2011 study into the same type of cancer but with a larger sample size published in the journal Cancer Biomarkers. The charity has also been working with renal and prostate samples; in the latter it has achieved 93% reliability compared to the 75% false positive rate of the traditional tests. In Feb 2014, Medical Detection Dogs were invited to demonstrate their skills to Prince Charles and the Duchess of Cornwall at St James’ Palace. Subsequently the Duchess became a patron of the charity, which works with researchers, NHS trusts and universities. 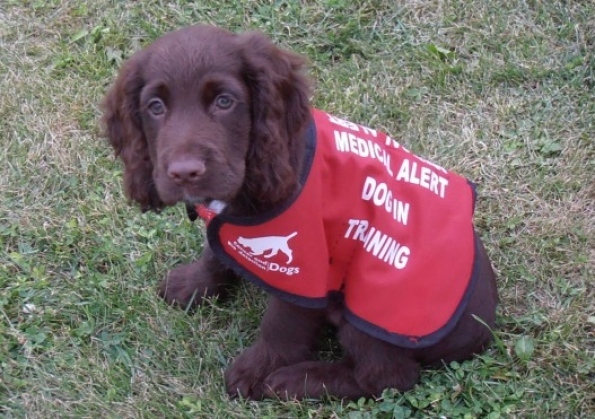 The Medical Alert Assistance Dogs it trains help individuals with complex medical conditions such as diabetes, and the animals can identify odour changes associated with certain medical events such as a drop in blood sugar level. Currently there are 50 dogs partnered with diabetics in the UK and with more funding this number will increase. When I grow up I want to become a Medical Alert Dog...just like my mate Molly!